To avoid someone installing Spy or Tracking Apps on your phone, Google alerts users once in a while of PUPs (Potentially unsafe programs). But the same will be a problem if you are trying to catch your cheating spouse or troubled kids by installing a tracking app on their device. Google security, if enabled, scans mobile for any spy ware and throws an alert once in a while forcing user to uninstall the app. 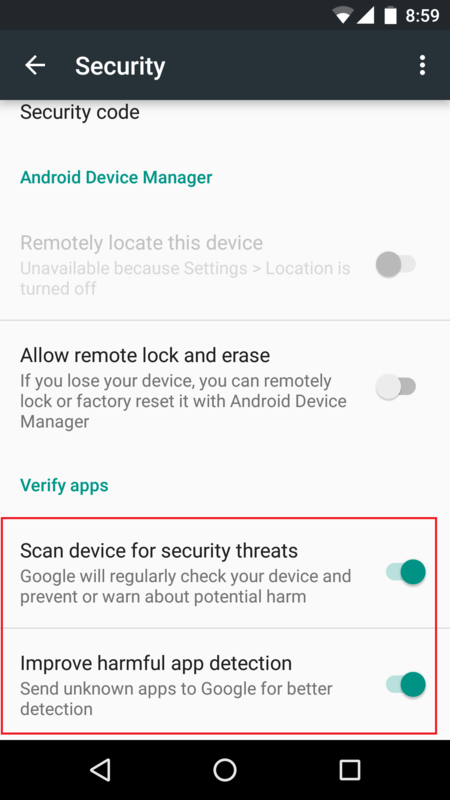 To disable Go to Settings -> Google -> Security -> And uncheck “Scan Device for Security threats”. The location of this option might differ in other mobiles. Please note this will also disable warning of any virus program. As long as the mobile is not downloading apps from Unknown sources, its fine. Make sure no icon is displayed on the app drawer. Application can also be hidden via third party apps. Disable all notification so that users are not notified by the app of any activity. You can long tap on notification when it appears and select “Stop Notification” and it wont appear again. Even some of the anti virus programs will display virus/malware/PUP alerts for spy program even though they are not malware or virus. To disable these either uninstall the anti-virus or mark the program as safe and disable any future warning for that specific program. That’s interesting. You mean even after disabling “Google Play Security Scan”, Android still was deleting the app? How to stop annoying notification of “Potential app – settings” in Samsung Galaxy S6 with Android 5.0 Lollipop ? I could not find where to disable the notification. It should be in some place under “Settings”. Under Google and Security. I installed the application in my wifes phone. It worked well. Now when i send request to retrieve it says sending failed. User must have uninstalled the app on device. Tell me how I can get the call details again. I installed the app when she was with me in Africa. Now that she has gone to India, I cant access her phone for two months. Please help. I am ready to pay any fes if it can be reinstalled anonymously. You cannot install it remotely. She might have uninstalled the app. Unfortunately there is nothing that can be done. I have not receive any recorded calls in over 10 hrs. How long does it take to send an email or when will it be ready? Either mobile is not online or the app is uninstalled from phone. It should be instant, less than 10 minutes. Why won’t the hide app feature work for Galaxy 4. The option won’t show at the top like it does with the galaxy 6. What to do to hide the icon? Try to click on the menu button of mobile, it will show you that option. If you need to access the app again ager bring installed and you’ve selected hide icon, how can you access it. On youryour utter application you dial a number and it will interface with it and open. pls how can I listen to the audio recorded, is it from my email account that I registers with or the above site? pls reply. Which app you are using? just tell me how do you earn from these apps? I haven’t seen any ad or premium plan.. then how? do u sell our data? Hi, We dont sell any data (not even your email ids). Ads put on apps are disabled by AdMob. We will be putting new Ads soon. post is explained clearly so that we are able to understand it clearly. how I get full apps in my lifetime? using this apps few day then the apps say give a payment. so how I get free spy apps life time. is it possible.? All apps on this website is free for lifetime. Which app you are referring to? The issue I am facing is, when I send the command to get the update, I am not receiving recorded calls on the site and the email notification as well. When I check the mobile, app is still exists and it has data connection too. Then I unregistered and then reinstalled the app, it works fine. How to overcome this issue ?? Why it fails to respond the command ?? Hi Vinoth, can you install our latest version and check? I installed the application in my sister phone. It worked well. Now when i send request to retrieve it says sending failed. User must have uninstalled the app on device.in over 8 day. Tell me how I can get the call details again. Looks like user has uninstalled the app. You need to download the app again and register. Kindly try our latest version (version 9) of remote call recorder, that should work. Our next release tomorrow should solve this issue. Kindly follow our facebook page. Can it work on mi 3S prime. When m click on get call then it’s shoes in installed phone that call recorder stopped. Our next release will fix this issue. Kindly follow our facebook page to get notification of new releases. I had the app for a long time and all of the sudden when i try to retrieve calls it says remote record has stop working.. I unstall and install new version but i am still not able to retrieve calls.. Can you help me with this?? Hi Jc, kindly try to install it now and before that clear storage from Mobile Settings -> Apps -> Recorder -> Storage -> Clear Data. how can i find the .settings1 folder of this app. any ap for this. if i dont receive the recording i can get it from there am i correct. Download any file explorer app from google play to the mobile. Open the app and browse to “.settings1” folder. It will at the top itself. Else you can connect the phone to laptop and you will find this folder and see if there are any call records inside. sir, please refer some party apps.for hide icon on app drawer. I keep getting notifications about incoming calls.but when I try to log in I can’t living. Hi, that happens if you have unregistered from website but not uninstalled the app from device. Kindly uninstall the app from device and register again if you want to pull call records. I have earlier used the recorder app in redmi 3s prime. it worked properly. Now i have installed the smartphone app on red mi 3s prime. No calls is being recorded. Please tell the solution. Redmi might be having its own call recorder. You will have to disable that first. Also make sure proper permission for apps to run in background is enabled.